NASA's Opportunity rover tracks across the Meridiani Planum plains, where it has found evidence of past water, and its chemical makeup, in rock outcrops. Researchers can now say definitively that Mars once supported a watery environment, but whether the red planet could have ever supported life is still far from certain. The success of NASA's Mars rover Opportunity in finding tell-tale signs of past water at its Meridiani Planum landing site has left some researchers believing the region could have once been a habitable, albeit still hostile, environment. "We can say 'yeah, it was probably a habitable environment, but was it an environment in which life could have arisen,'" said Cornell University's Steve Squyres, principal science investigator for the Mars rover mission, in a telephone interview. "That's a good question." 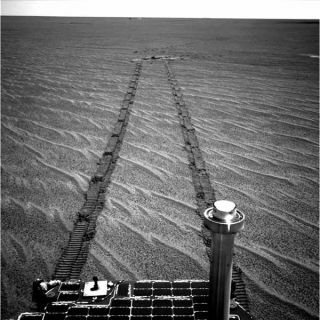 While Opportunity has not found any signs of life since landing at Meridiani in January, knowing water was once abundant there makes it a good candidate for future study. "In everything we know about life on Earth, there is no known example without liquid water," Squyres said. "That's the reason the search for water was so important at Mars." Squyres' Mars water research appears today in the journal Science alongside a series of other studies from data taken during Opportunity's first 90 days on Mars. Since then, the hardy rover has tallied about 300 days exploring Mars while its robotic twin Spirit has spent an even longer time trekking across Gusev Crater on the other side of the planet. If some sort of life did take advantage of Mars' watery past, it may have had a hard time of it. Researchers are not sure how widespread water was and how long it may have persisted, which could have put restraints on the development of microorganisms and other creatures. "One of the questions we don't have and answer for is how the water was situated," Squyres added. "Was it sort of little localized puddles or continuous over kilometers?" Squyres said it is also unknown whether any of the water bodies that once littered Meridiani were exposed to the atmosphere. They may have been covered by an ice shell, with water oozing up out of the ground, he added. Researchers were able to determine -- with the aid of Opportunity's science package -- that liquid water did flow on surface of Mars in the past, its currents etching ripples in stone as a calling card. "Now we have a fairly specific indication of what the water medium for life may have been like," said Jeff Kargel, a researcher with the U.S. Geological Survey in Flagstaff, Arizona who commented on Opportunity studies in today's Science issue. "We don't know if there was life on Mars, but it certainly is more of a plausible idea." Mineral deposits left behind as Martian water evaporated include substances like hematite and jarosite, which indicate a once wet, acidic and salty waterscape. "[Mars water] must have been very acidic to support the formation of minerals like jarosite, at least as acidic as tomato juice," Kargel told SPACE.com. On Earth, such acidic or saline-rich waters - such as the wine-colored Rio Tinto basin in Spain. "The stuff is just teeming with life," Squyres said of Rio Tinto water. "But the organisms there didn't develop first in that environment...they evolved to inhabit it." Whether similar life could have originated in the water environment of Mars' past is unknown, Squyres added. Understanding the composition of past water on Mars has helped researchers shape their view of the planet's watery history. "There's much more to it that just saying water was there," Squyres said. "We've made some significant steps in characterizing what the water environment was like." Kargel and Squyres agree that going back to Meridiani Planum with a future mission and returning a physical sample to Earth could shed more light on the region's aqueous past, as well as the possibility of life there. If any organisms ever lived in Mars water, the nature of the rocks at Meridiani Planum would have been adept at preserving chemical and physical fossils of them, they said. "I'd love to get a hunk of some of this stuff and get it into the best laboratory on Earth," Squyres said. But some researchers urge caution. In his Science commentary, Kargel stated that future Mars missions may need to assume life exists first in order to effectively prevent contamination to both Mars and Earth in future sample return or human missions. "The idea here is to get the bio-burden down," Squyres said. "I think as responsible explorers we have an obligation to keep contamination to a minimum."